King Nebuchadnezzar said to them, "Is it true, O Shadrach, Meshach, and Abednego, that you do not serve my gods or worship the golden image which I have set up? Now if you are ready when you hear the sound of the horn, pipe, lyre, trigon, harp, bagpipe, and every kind of music, to fall down and worship the image which I have made, well and good; but if you do not worship, you shall immediately be cast into a burning fiery furnace; and who is the god that will deliver you out of my hands?" Shadrach, Meshach, and Abednego answered the king, "O Nebuchadnezzar, we have no need to answer you in this matter. If it be so, our God whom we serve is able to deliver us from the burning fiery furnace; and he will deliver us out of your hand, O king. But if not, be it known to you, O king, that we will not serve your gods or worship the golden image which you have set up." Then Nebuchadnezzar was full of fury, and the expression of his face was changed against Shadrach, Meshach, and Abednego. He ordered the furnace heated seven times more than it was wont to be heated. 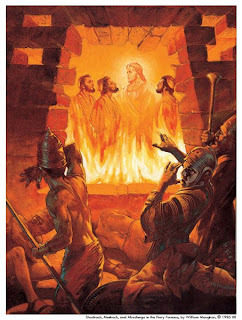 And he ordered certain mighty men of his army to bind Shadrach, Meshach, and Abednego, and to cast them into the burning fiery furnace. Then King Nebuchadnezzar was astonished and rose up in haste. He said to his counsellors, "Did we not cast three men bound into the fire?" They answered the king, "True, O king." He answered, "But I see four men loose, walking in the midst of the fire, and they are not hurt; and the appearance of the fourth is like a son of the gods." Nebuchadnezzar said, "Blessed be the God of Shadrach, Meshach, and Abednego, who has sent his angel and delivered his servants, who trusted in him, and set at nought the king's command, and yielded up their bodies rather than serve and worship any god except their own God." Jesus said to the Jews who had believed in him, "If you continue in my word, you are truly my disciples, and you will know the truth, and the truth will make you free." Jesus answered them, "Truly, truly, I say to you, every one who commits sin is a slave to sin. The slave does not continue in the house for ever; the son continues for ever. So if the Son makes you free, you will be free indeed. I know that you are descendants of Abraham; yet you seek to kill me, because my word finds no place in you. I speak of what I have seen with my Father, and you do what you have heard from your father." They answered him, "Abraham is our father." Jesus said to them, "If you were Abraham's children, you would do what Abraham did, but now you seek to kill me, a man who has told you the truth which I heard from God; this is not what Abraham did. You do what your father did." Jesus said to them, "If God were your Father, you would love me, for I proceeded and came forth from God; I came not of my own accord, but he sent me.much to judge; but he who sent me is true, and I declare to the world what I have heard from him." "Go ye therefore and teach all nations, baptizing them in the name of the Father, and of the Son, and of the Holy Ghost: teaching them to observe all things whatsoever I have commanded you: and, lo, I am with you always, even unto the end of the world" (Matthew 28:19-20). This great royal commission, from the Lord of Hosts, has been valid until the present, and shall be so until his second advent, which is imminent. It is the sacred obligation of every loyal member of the body of Christ to be obedient, and to preach the Good News of salvation. Fulfilling the Great Commission is the greatest of all achievements, the highest call ever given to mankind! What a privilege it is to respond to the call together! Surely the Church is not left alone to do her task, but with the encouraging promise that her Savior would be with her to the end of the age. However, as a faithful Christian, before you go out and share your faith with others, you need to be strong in the faith yourself, you need to be extremely confident in the message that you are sharing; otherwise the slightest bit of opposition could make a doubter out of you. Today, probably more than ever, the Church is facing a lot of opposition; tragically, the Church is not only being attacked from those outside the faith, but from inside. They alter and change the words in the Bible to make it compatible with their deviant immoral lifestyles, and they attack the character of our Lord and Savior Jesus Christ, "even denying the sovereign Lord who bought them .. ." (2 Peter 2:1). One day a beloved friend invited me for dinner. On that night he introduced me to a young man of the Hindu faith named Shamu. Although I was initially surprised, I sensed that this was an opportunity to share the gospel of Christ with this new friend. Having relaxed for a moment and prayed, I turned to Shamu and asked him if he believed in the Lord Jesus Christ. He answered gently, "I have heard about Jesus, but I do not believe in Him as the Christians do. We have many teachers and philosophers who have written good ethical teachings just like those of your Christ." I replied, "It is true that there were many ethical teachers throughout Asia, before Christ, but it is important to know that Jesus Christ did not come merely to give us good moral and ethical teaching; He came to give us forgiveness of sins and salvation. Jesus came to give His life as a ransom for many (Luke 10:45b). Jesus came 'to call us out of darkness into His marvelous light' "(1 Peter 2:9b). I explained to him how those who do not believe in Christ stand in condemnation (John 3:16-18). Shamu did not want to know more about Jesus or about salvation. Instead, he did what many try to do: to deflect the conversation away from the personal responsibility to have faith. He tried to discredit the person of the blessed Lord. Shamu ironically asked, "Can you tell me, Father Joseph, where your Christ was from the age of twelve to thirty?" He then proceeded to tell me that he had read a book about Jesus' travels to India where he sat at the feet of a Hindu Yogi to learn yoga that would enable him to do miracles. My answer was quick to my lips, although Shamu was reluctant to hear about God's grace and tried several more times to change the subject. My friend and I shared with Shamu our love and our desire for him to be included in the Christian family. Some of you might ask, why should we bother to say a word about Jesus to non-believers? The answer is simple. Other than what had been mentioned previously, that it is a command from our Lord to do so, you need to understand that those who do not believe are standing in condemnation. Love for those without a belief in Christ would surely motivate anyone with an ounce of compassion to make the very best rescue attempt for their salvation. The Lord Jesus Christ is the light of the world who said that if we believe in Him, we are not condemned, "but he who does not believe is condemned already, because he has not believed in the Name of the only begotten Son of God. And this is the condemnation, that the light has come into the world, and men loved the darkness rather than Light, because their deeds were evil" (John 3:18-19). Spreading the word of that light, in season and out of season, is our mission. Therefore, the motivations of obedience to Christ's royal commission and of love for the unbelieving soul inspires the believer to speak with confidence and boldness. The message is clear and simple. We as faithful Christians have to respond to the mandatory command of our Lord because we do not have the option of keeping the good news of salvation to ourselves. So let us concur with St. Paul: I am not ashamed of the Gospel of Christ, for it is the power of God to salvation for everyone who believes" (Rom. 1:16). From the article: Share your Faith with Confidence by Archpriest Joseph Sakkab, Dean The Prarie Deanary, Aniochian Orthodox Church. nor find thee except if thou reveal thyself. Let me seek thee in longing. and love thee in finding. Amen.